Thank you Allen Longstreet for taking part of this week’s BOD author spotlight interview! It’s a great chance for all of us to peek into the mind of one of our member authors. So, thank you! Your bio mentions you’ve been writing all your life. What is the first story you wrote, and when did you know writing was one of your passions? When I was in second grade I wrote poems. I tried to sell them around my neighborhood. My teachers told me I was ahead of my classmates in writing. I got a level 4 on the state mandated writing tests in 4th and 10th grade. The first story I wrote was called “Fantasy.” I was in 5th grade. At the time I was into Kingdom Hearts and especially Final Fantasy X video games. I’d dream up different characters with superpowers. I loved a world where every person had a power. I wrote “Fantasy” with an ink pen on a 180 page 5 subject notebook. In middle school, I put it on the backburner. I still have it. Maybe I’ll make it into a YA series someday. I always reply with the same answer, and it will never change…My favorite part of being a writer is creating a world, a story, and people that didn’t exist before I made them. I also love that the written word can bring tears to a reader’s eyes. It’s the most beautiful thing. Rebearth is your first published book. Can you tell us a little about it and what inspired you to write it? 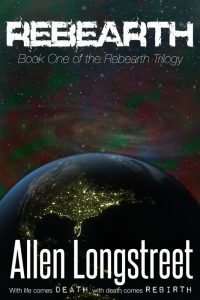 Rebearth is a story about the Rebirth of Earth. Hence the name. It follows Everett Tucker and Ellie Andrews as they struggle to survive with minimal resources after the largest solar flare to hit earth since the Carrington Event in 1859—which to this day was the biggest flare to have ever hit the Earth. I used to be obsessed with Mexican/Central American/South American culture for a while. Especially the Mayans. So, placing the event on Christmas Eve of 2012 felt natural. My favorite author is Wade Davis. He is a non-fiction author with a PhD in Ethnobotany; the scientific study of the relationships between plants and humans. Also, my Botany teacher from high school, Mr. Campbell, gave me the inspiration to put my ideas on paper. The man changed my life, in a good way! Many post-apocalyptic books deal with humankind searching for higher meaning and purpose in humanity when faced with destructive and uncertain futures. Can you tell us how this idea resonates with Rebearth? Like you said, this idea is found in many apocalyptic works, and for good reason. In Rebearth, the main characters, especially Ellie, realize that the “Old World,” as they begin to call it, isn’t coming back. During the first two days they are faced with circumstances they never even imagined having to think twice about: using the bathroom, keeping a fire burning, and conserving drinking water. Early on, after Everett’s supply of canned goods runs out, he and Ellie go 72 hours without food. Everett sees weakness overcoming Ellie, and he realizes the catch 22 of their new life. They have to keep themselves nourished in order to hunt, and hunting is the only way to keep themselves nourished. As an author, this is one of my favorite moments. In a post-apocalyptic world, everything becomes more difficult. In the climax of the novel, Everett is faced with something he could have never imagined. How do you think this affects his agency to choose and become what he wants, and do you think this same idea pertains to humans off the page? Yikes! Answering a question about the climax…. How can I answer this without giving the climax away?… Well, for one, the lessons that were learned throughout the novel definitely resonate with the main characters, as with the supporting characters they meet towards the end. I feel it does affect his agency to choose. But in reality he doesn’t have a choice, because he was chosen, in a sense. The Earth is being reborn, and regardless of if he chooses to turn a blind eye or not—things will still keep moving on in the direction the climax indicates. Book 2 of the Rebearth Trilogy, Reconnect, will move into a lot more of a dystopian setting. One of the things I really enjoyed about Rebearth was the importance of creating strong familial and friendship bonds. Are Everett’s relationships influenced from personal experience? Yes. I have to admit, a few of the characters are based off of real people, some of the names changed to protect the people. As a newbie author, I thought to myself, “If I want to create vivid imagery for the reader, what better way than to base it off of some experiences and locations I know in real life.” I wanted to give the reader the movie-reel feel as they read. Mr. Campbell was the only character that I had permission to use his real name, including his son, Jack Campbell. He was such a sport through the whole thing! He helped me with many of the plants I chose to use in the book. Keep in mind, every location, school, street, etc., is a real place in Hickory, North Carolina. What can you tell us about your soon to be released book, The Gambit, and are there other projects you’re working on? If you look up the definition of “Gambit” here is what you will find. 1) (in chess) an opening in which a player makes a sacrifice, typically of a pawn, for the sake of some compensating advantage. 2) device, action, or opening remark, typically one entailing a degree of risk, that is calculated to gain an advantage. The Gambit is a Political-Thriller, but part of me wonders if I should classify it as a dystopian thriller. I had this idea as I was finishing up Rebearth of a story involving a main character who in a sense was a pawn, a sacrifice, to a more ominous plan. All I can say is I wanted to create something that was a fast paced page turner. Something like The Bourne Series movies combined with the complexity of a Christopher Nolan film. I like my novels to come full-circle. I am not a fan of cliffhangers, unless it’s in a series. If you could go anywhere in the world, where would it be, why would you go there, and who would you go with? The list is gigantic, but if I had to, I would choose to go to the Seychelles Islands; an archipelago that lies in the trade winds, perfect weather all year round and no cyclones, and some of the best beaches in the world. Thanks again Allen for spending time with all of us at BOD! Hunt, eat, starve, repeat. This is the new life of Everett Tucker, and Ellie Andrews. On Christmas Eve, a colossal X-Class solar flare larger than any in history directly hits the Earth. All technology is useless. Their parents are gone; Everett has only a shotgun and a backpack filled with survival gear to assist them. They are alone. The Western North Carolina winter is brutal, and the people cruel. Despite the hardship, there is a small flame of hope on the horizon. There is a light in the darkness. Something is changing—the Earth is being reborn. 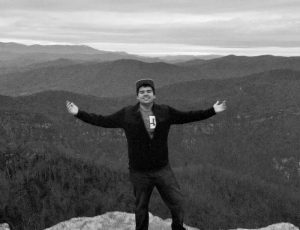 Allen Longstreet is a fiction author who resides in Hickory, North Carolina. Now at 21, he has been writing ever since he was a child, and novels have always been the goal. With a background in Botany and Ecological sciences, he has a preference in Post-Apocalyptic and survival. Allen has a strong interest with contemporary issues and problems society faces in this day and age. He plans on writing across a broad-spectrum of fiction, creating characters and stories we all can become attached to.